Carl Sherry Kamani Natural Edge Bowl 3.9" x 7.9" x 7.25"
Carl has sanded and finished this bowl to a very fine finish. 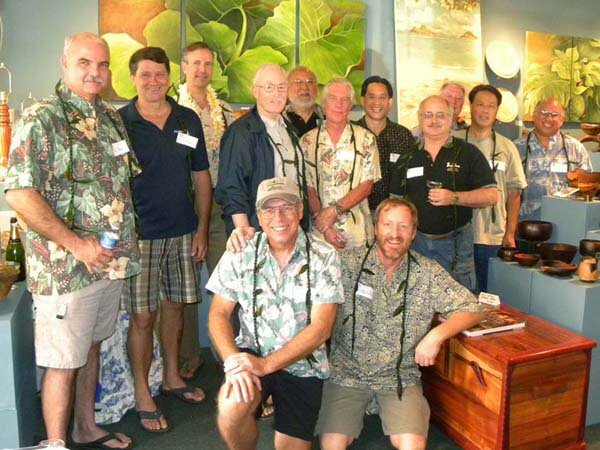 Oahu craftsman Carl Sherry was born and raised in Manoa Valley on the island of Oahu, and attended Honolulu Community College. He spent his adult life working to help others through job training and workforce training. Many people remember him with aloha for his support and kokua. Nohea Gallery is honored to share his work with you. 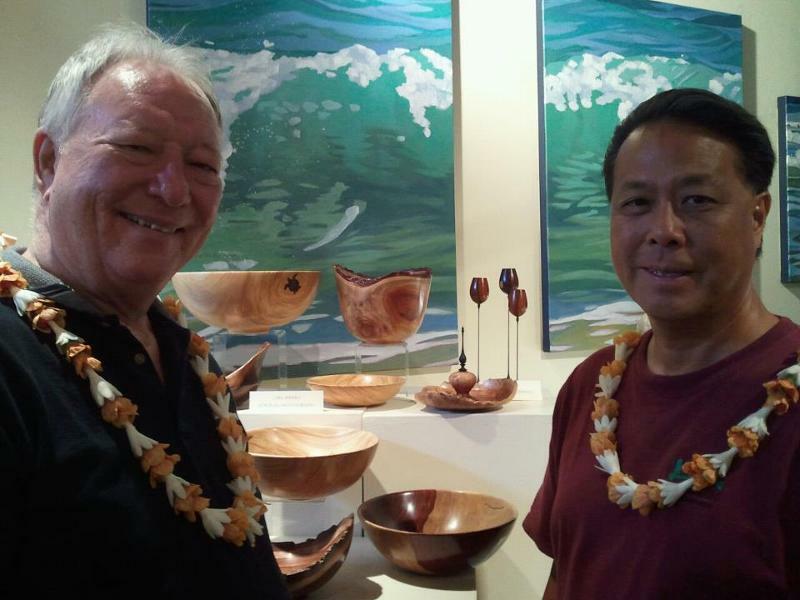 Carl is dedicated to providing quality woodturnings of beautiful Hawaiian woods, and is especially known for his extraordinarily fine finish. As an artist, he always strives to make “that perfect bowl” and appreciates that others enjoy his work. His first wood project was a Koa rocking chair, but when Carl noticed that people were asking for the cast-off curly wood from projects to make pens, he too learned to turn pens on a lathe. Bowls were the natural progression from there. “A member of the mangosteen family with the scientific name of Calophyllum inophyllum, kamani was brought north to Hawai`i from the South Pacific islands in early migrations of Polynesian settlers. Also called Alexandrian laurel, true kamani was probably introduced by seed, which is how it is propagated. This native of the Pacific and of tropical Africa, grows slowly along sandy shores and in lowland forests. It was cultivated in villages, near houses and also in groves away from villages. When found growing in windy areas it is sometimes in a picturesque, crooked or misshapen form. True kamani is not to be confused with “false kamani,” a common tropical almond that grows profusely along the shores of Hawai`i. This false kamani or “kamani haole” was introduced after the first white settlers arrived, and has the scientific name of Teminalia catappa. It was planted for shade and as an ornamental, also growing from the edible seed in its corky pod that washes ashore with waves and currents. True kamani is a large attractive spreading tree up to 60 feet high, with a rounded head of dense foliage and rough grey bark. A reddish-brown hardwood is derived from the trunk. From this was carved many objects including canoes; homes; `umeke la`au, wooden containers or calabash, specifically `umeke kamani, food bowls and trays called pa kamani. As with milo and kou wood, there is no bad-tasting taste or odor in kamani wood, so it is perfect for vessels that will be contacting or containing food. The leaves of kamani are large, stiff, shiny, leathery and oblong with a blunt tip. They are 3-8 inches long, arranged opposite each other and have closely placed fine parallel veins running from a prominent raised yellow-green midrib to the leaf margin. When new, the delightfully fragrant flowers are small, 1 inch wide, and white with 4-8 petals. They smell like orange blossoms and were used to give fragrance to kapa cloth, and also for lei making. They are waxy and showy with golden yellow stamens and a pink pistil, and grow in clusters of a dozen or so flowers found hanging from a long stalk. The fruit begins pinkish-green, rounds out to about 2 inches long and becomes bright green. When mature, it has a thin leathery dark grey-brownish skin which covers a bony shell that holds a partly poisonous kernel or seed surrounded by a cork-like substance. A lamp oil for light was produced from the kernel and was used at times instead of kukui nut oil. The kernel is called a “punnai nut” in some areas of the Pacific, and the oil is dark, green, thick and called “dilo oil.” Sometimes this oil is useful for lomi lomi, massage, especially when enhanced with coconut oil or flower fragrances. The oil may have been useful in waterproofing tapa cloth. Kamani (or tamani) oil from other Polynesian nations is now being imported to Hawaii for use as an oil to heal the skin. The seed, leaves, gum and bark are said to have medicinal properties. In the old days an extract from the fruit was used to make a brown dye to color tapa cloth. Examples can be found today at Bishop Museum of bowls from ancient days in Hawaii. Gordon’s shapes are true to the old forms and beloved for that reason. To care for your bowl by Carl Sherry, keep it out of bright sunlight and water, and dust it occasionally for many years of enjoyment. The dimensions in the item description are for the bowl itself; dimensions under ‘additional information’ tab includes packing size when this item is packaged for shipment, mahalo.